Ramachandraiah prints movie posters for a living. He’s done it ever since 1971, when he bought an ancient lithograph press. He keeps it in a factory north of Bangalore, far from the English town where it was built 111 years ago. Most movie posters here are lavish. They’re digitally-printed, full-color, and reach up to 30 feet long. His are five-color, hand-drawn, and measure just 20 inches by 30 inches. They’re printed on thin paper, and illegally slapped up on building sites and highway overpasses late at night. They cost pennies to print. And they’re absolutely gorgeous. In his small store-front, filled with shrines to a famous Kannada actor, Ramachandraiah sat me down with a tiny cup of coffee, and plucked two biscuits from a package. It had taken me a month to track his shop down. I’d finally found it, hidden in a maze-like neighborhood of local movie theaters and one-shop film distributors. I wanted copies of the posters — all of them — especially the American ones. Outside on the sidewalk, the artist Raju set aside the poster he’d just finished for a Hindi-dubbed 3D run of Underworld: Awakening. He immediately started on another. 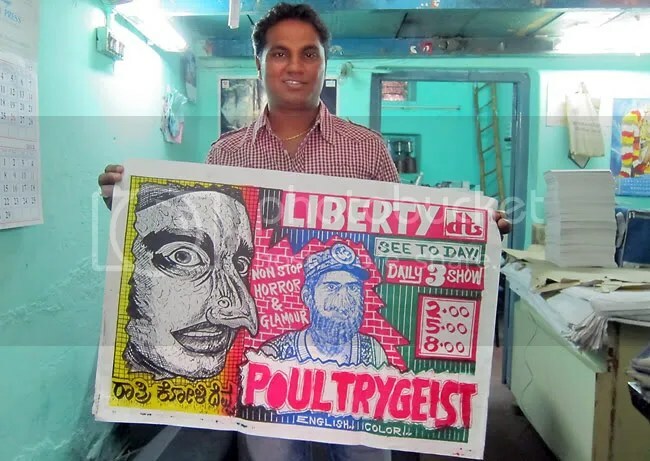 Raju draws a poster every three hours. In a week, he creates campaigns for dozens of movies. He traces movie stills or posters, or ads from the paper. Sometimes he just eyeballs other flyers for the same films. And I love the drama, the movement, the passion that he’d capture in his posters. I also loved the color. From one print to the next, it changes as the litho inks mix and combine. 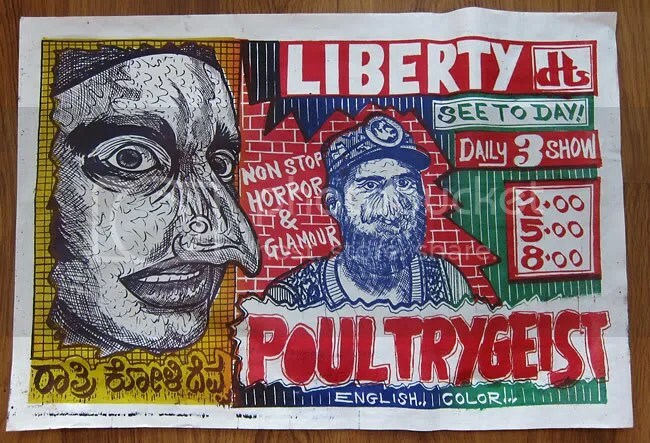 The poster I most wanted was for Poultrygeist, the fowl gross-out musical I made a decade ago with my childhood hero Lloyd Kaufman. I wanted a Kannada original. “What does Poultrygeist mean,” Ramachandraiah asked. “Poultry means chicken,” said Raju. Ramachandraiah pulled out an old dictionary, and started leafing through it. Raju flipped through a collection of printed publicity stills I’d brought. They argued about which ones would work best. A week later, I returned. The hundred posters were shoved in a corner, rolled up in a tight pile. Again, Ramachandraiah sat me down with a small cup of coffee and two biscuits, while his son unrolled the package. “Dip the biscuits,” he urged. His son held up the top poster. What movies would you choose? What stills would work best for this? And let me know if you’d like one. This entry was posted on February 1, 2012 at 4:05 AM and is filed under Refugee. You can follow any responses to this entry through the RSS 2.0 feed. You can leave a response, or trackback from your own site. thanks for posting Shetty.. SUPERB stuff! What talent to sketch a fair likeness to the actors. Very original. Only in India a handmade thing would go for peanuts. These are beautiful! I can see why you feel the need to own them. What a brilliant find, and well done on tracking them down. Thanks so much for sharing – and thanks Shetty for the additional link.